Hostile takeover in the bee yard? To follow up on the mystery swarm…they continued their flaky behavior until I inspected a hive in the yard on Sunday (8-18). As I was closing up, there were suddenly far too many bees in the air. Then they were bearding the face of the afore-mentioned hive. I closed up the hive, fearing for my queen in the midst of what was beginning to look like a hostile takeover. As I was standing around scratching my head, I saw a queen on the side of the hive. 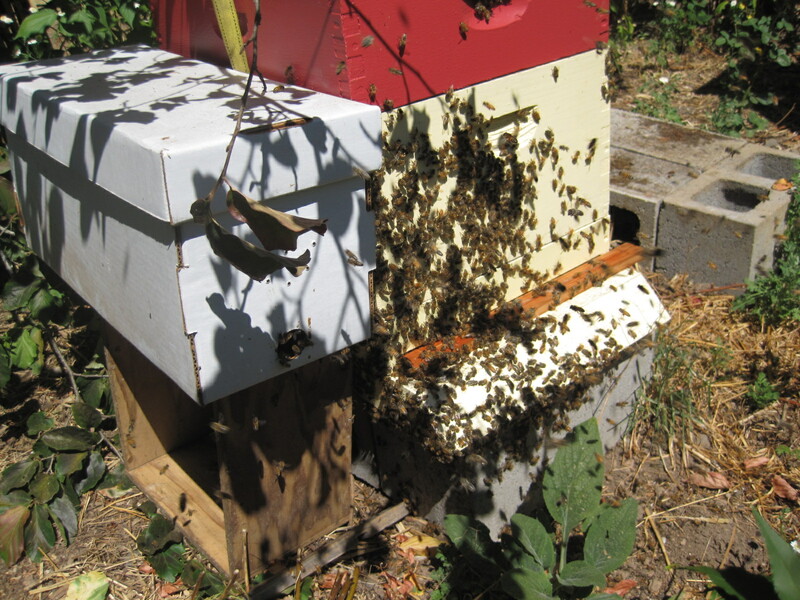 I scooped her up in a queen cage and placed her in a cardboard nuc box directly next to the bearded hive, hoping that the bees that were attempting to enter would be attracted to their queen and instead enter the nuc. It worked for a night, the bees buzzing around the caged queen til morning, when they abandoned her for who knows what quarter. The poor queen, quite fat and healthy-looking, is now awaiting her fate with several attendants in my kitchen.